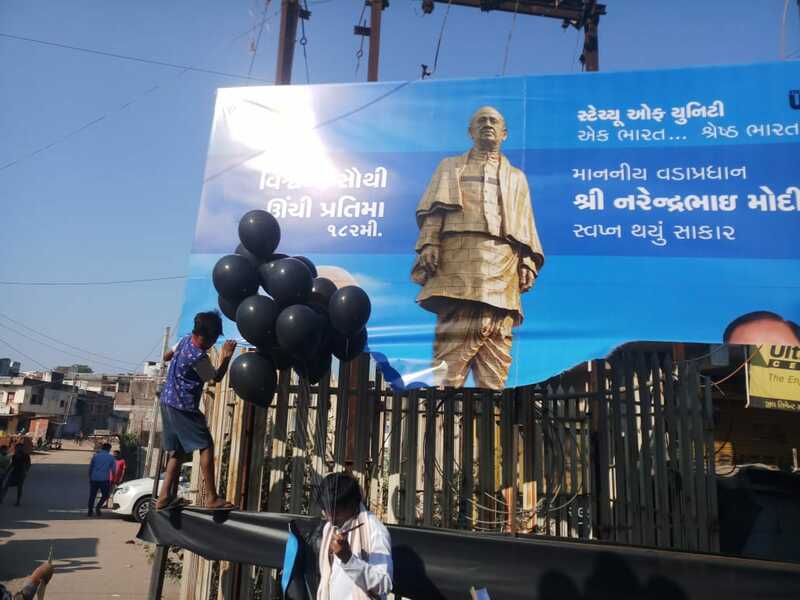 Activists, villagers detained as PM inaugurates world’s ‘tallest’ statue in a Gujarat district that does not have hospital, schools. Narmada district was formed in 1997 out of Dediyapada, Nandod and Saghbara talukas carved out of Bharuch district and Tilakwada taluka carved out of Vadodara district. With tribals dominating about 85% of the population of the district, it is by far one of the poorest districts of Gujarat. Since its formation, the district has had no government hospital with modern amenities and intensive care unit facility. Severe cases of illness or accidents are referred to Vadodara, a district about 90 kilometres away from Narmada. Reportedly, the only blood bank of the district was formed two years ago. 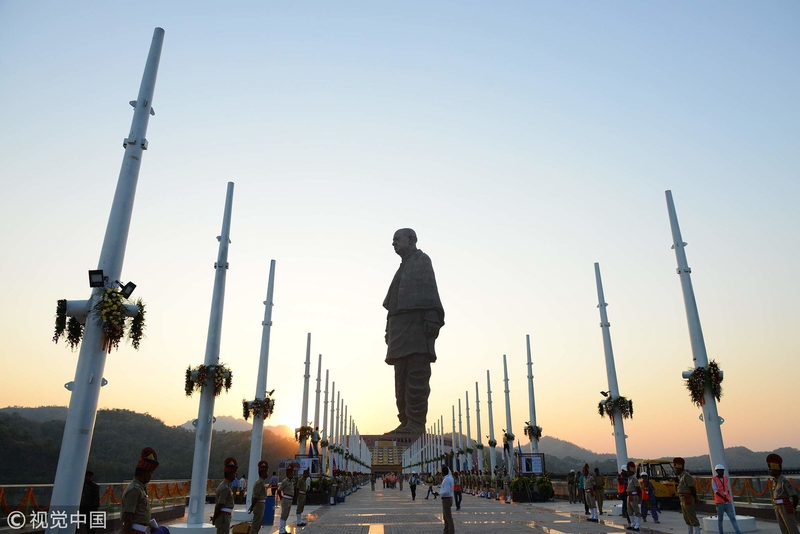 Picture the contrast when the 182-feet tall Sardar Patel statue named ‘Statue of Unity’, touted to be the ‘tallest’ in the world, was inaugurated by Prime Minister Narendra Modi in Kevadiya, about 30 kilometres from Rajpipla, district headquarter of Narmada on October 31. The area was milling with more than 4,000 police personnel with one Additional Director General of Police, one Inspector General, five Superintendents of Police and more than 30 Deputy Superintendent of Police, as thousands of tribals protested throughout the district. “A district where tribals worry about the availability of ambulance on the right time because there is no proper road has been chosen to be the location for Rs 3,000 crore project. Tribals, whose villages have no roads, are losing their land for construction of the four-lane road to the ‘Statue of Unity’,” Praful Vasava, tribal leader of the district told Newsclick. “Why is this district not being developed first? Instead, the government is grabbing the tribal land that falls under Schedule Area Act without the permission of gram panchayats,” he added. 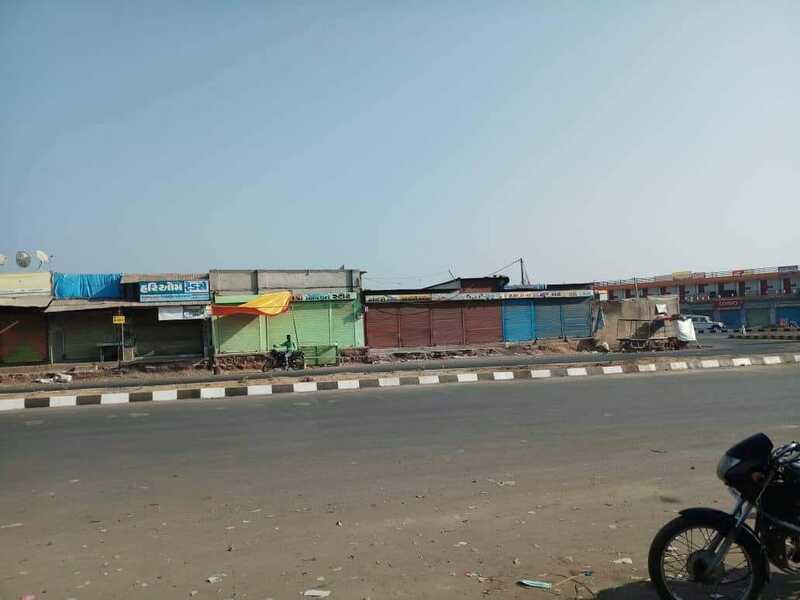 On Wednesday, while cameras flashed as PM Modi arrived with a battery of VIPs, the Rajpipla market bore a deserted look as shops remained shut observing a bandh as a mark of protest. Black balloons were flown in the air and tyres burnt to generate black smoke as the event unfolded. “The shopkeepers of the Rajpipla had been threatened by the local police after they put up notices declaring a bandh call on October 31st,” Vasava said. According to villagers, the police had begun detaining people since the evening of October 30, by brazenly knocking on random doors of tribal homes and picking up people without stating. Ninety activists who had arrived in solidarity with the movement of the tribals have been detained. These included Rohit Prajapati, Nita Mahadev, Mudita Vidrohi, Virji Viradiya, Amar Singh Choudhary, Anand Mazgaonkar and Lakhanbhai. Nita Mahadev and her daughter Mudita were forcibly brought back to Ahmedabad with only male police accompanying them. 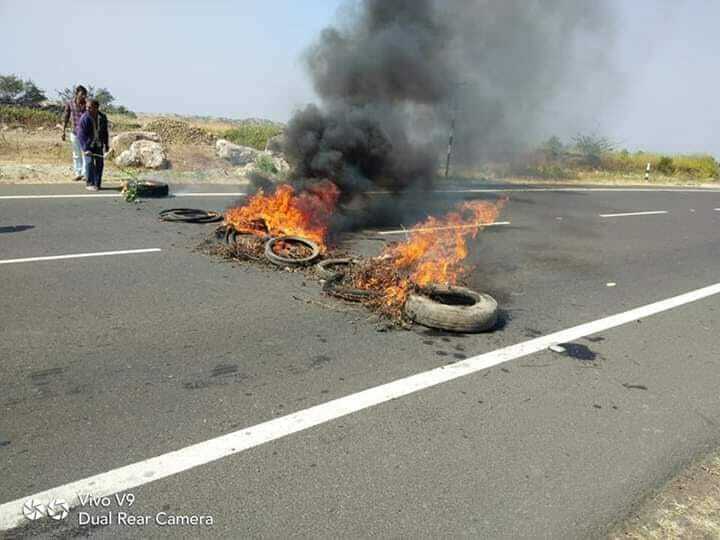 Vasava, local tribal leader who had called the bandh and was leading the protest, was detained on October 31 while flashing a placard stating “Narendra Modi go back” written with his blood. 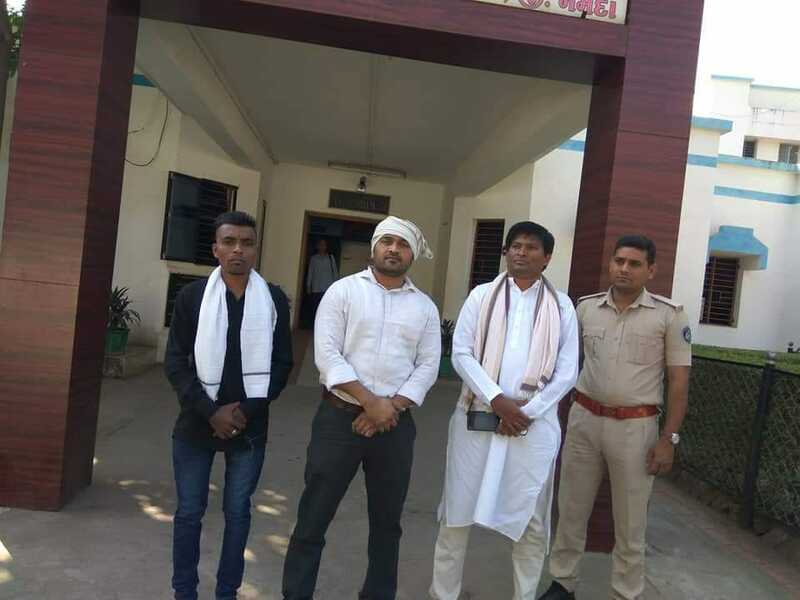 “In all likelihood, the police will be deployed at every household of villages around the statue,” said Lakhanbhai, an activist working amongst the tribals, who was also detained. In all, 72 villages of Narmada district and about 75,000 tribals are affected by ‘Statue of Unity’ project, Sresth Bhawans, valley of flowers and the four-lane road leading uphill to Sadhu Bet, the spot where the project is located in Kevadiya. Displaced villagers from the 19 villages that were originally recognised as ‘project affected’ and promised rehabilitation aid of Rs 5 lakh or a new plot of land, are still waiting with bated breath. Six villages – Navagam, Kevadiya, Gora, Kothi, Limdi and Waghariya -- have not been formally declared as ‘project affected’. However, about 90% of the land of Kevadiya village has been grabbed for widening of the road, land of Navagam and Waghariya is gradually getting submerged as dam water is released and water rises in the weir. In Gora, Kothi and Limdi, about 25% of the land has been unofficially grabbed after offering verbal promises of rehabilitation. This apart, 28 villages on the bank of the main canal of the Narmada river have not been allowed to use water for their parched land, which most of the tribal farmers are struggling to cultivate in a rain-scarce year. “A week ago, tribals of Kevadiya village were lathi-charged and detained and their homes were demolished before they were released,” says Govindbhai, sarpanch of Waghariya village that has lost all its land to the project. “Some women were injured in the lathi charge. Their land is being taken for Sreshtha Bharat Bhawan,” he added. Earlier, sarpanchs of 22 gram panchayats in Narmada district had written an open letter to Modi urging him to skip the inauguration ceremony, as he wouldn’t be welcomed in ‘their land’ in Kevadiya colony. “While the tribals of the district are struggling to avail basic amenities like hospitals, schools and drinking water, you decide to spend crores of money on construction of a statue and additional money again for an inaugural ceremony. With a heavy heart we, the villagers, are telling you that we will not welcome you on our land in our district,” read the letters signed by the sarpanchs. “We are not against Sardar Patel, we just want our land back or at least proper rehabilitation,” says Ambaben, who had first lost her land when Sardar Sarovar dam was built and remaining land is gradually getting submerged as water fills in the weir of the Narmada. “Before the dam was built, the land around the villages used to be fertile three-crop land. We never used any fertiliser as floods every year would bring in fertile silt. When the dam was built they took our three-crop land and the promised rehabilitation never arrived. Whatever we cultivated and whatever land remained with our family, where we have already cultivated vegetables, is getting submerged with the crop,” adds 60-year-old Ambaben, former sarpanch of Limdi group gram panchayat. “The tribals are fighting against the issue for more than 40 years now. It has been easy to fool tribals who are not educated and register a legal case. But now they are fighting back as this is not just a fight for the land but our culture and survival,” adds Lakhanbhai.